I’m so excited about ‘Grand Theft Auto 5‘. It looks amazing, and from the trailers and synopsis we have posted over the last few months, we can clearly see how much time, and talent has gone into this. So, recently, we have only known that the new game from Rockstar would release sometime in Q1 or Q2 of 2013, but thanks to an Amazon update, we know that the game will release March 26th, 2013. So get your pre-orders in for PS3 and XBOX 360. We can’t wait. Pre-order below and enjoy the trailer again. Behold!! 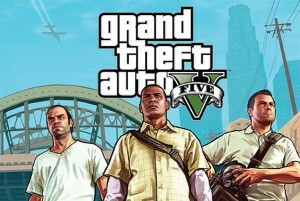 ‘The Grand Theft Auto V’: Official Gameplay Video Is Here!!! The New Trailer for ‘Grand Theft Auto 5’ Looks Amazing!!! This entry was posted on Monday, December 24th, 2012 at 2:20 pm	and is filed under News, Video Games. You can follow any responses to this entry through the RSS 2.0 feed. You can skip to the end and leave a response. Pinging is currently not allowed. « Film Review: ‘Django Unchained’! !